Creamy pasta sauces are great, but they can be calorie and fat-laden. Which is why lately I've been making this for dinner - low in fat, and you don't even cook the pasta sauce, just stir it together and toss with the hot pasta, with a little of the cooking water to loosen it. I'd originally thought of using spinach, but subbed the basil at the last minute. 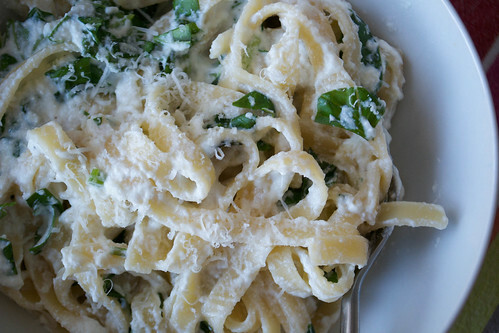 It's lemony and the basil really lifts the creamy ricotta. No fuss, light and a great dish for summer, too. Put the pasta on to cook in salted boiling water. While that's doing, get on with the sauce. Tip the ricotta into a large serving bowl (that you're going to tip the pasta in later) and squeeze in the juice of the lemon. Add a good pinch of salt and a grinding of black pepper and then add the chopped basil leaves. Stir everything together and set to one side. Once the pasta is cooked, lift it out with tongs (you'll need the pasta water in a minute) into the ricotta and toss well. Slosh in a little of the pasta cooking water, which will loosen and also season the sauce a little too. Once the sauce is the right consistency for you, taste and season again with salt and pepper or more lemon juice if you think it needs it. Serve hot, with some Grana Padano or Parmesan for grating on top, if you like.